211 (the name refers to the police code for a robbery) is a frustrating crime thriller that incorporates too many plot threads into the overall narrative at the expense of character identification, suspense, and emotional heft. Despite a high body count and the expenditure of extraordinary amounts of ammunition, 211 is inert. It provokes little reaction. The characters are as artificial as the setup and, on those occasions when the movie does something unconventional, it serves to illustrate how painfully unimaginative most of the story is. Perhaps a decade ago, snagging Nicolas Cage for the lead would have been a coup. Recently, however, Cage has been accepting anything with an attached paycheck. For that reason, director York Alec Shakleton is able to get a name to headline an otherwise anonymous cast. For his part, Cage sleepwalks his way through the part but even his comatose performance is light years better the ones provided by his co-stars. They vary from adequate (Sophie Skelton, Michael Rainey Jr.) to over-the-top (snarling bad guy Ori Pfeffer) to awful (Dwayne Cameron, whose line delivery is consistently awkward). Job #1 of any director is to draw an audience into the world in which his film transpires. The level of artifice in 211 is so high that we never believe anything that’s happening. It’s not immersive, involving, or particularly entertaining. The movie opens with an extended, superfluous prologue that shows how a group of ex-Special Forces mercenaries come to possess information about the location of $1+ million in cash they believe to be rightfully theirs. So they travel to this bank in small-town America and stage a heist. It’s well-planned and involves a mock “terrorist attack” to distract the local cops. Unfortunately, Officer Mike Chandler (Nicolas Cage) and his partner, Steve MacAvoy (Dwayne Cameron), don’t respond to the call because they have a “ride along” in the back seat – high school student Kenny (Michael Rainey Jr.) – and they don’t want to put him in harm’s way. So, instead of going terrorist-hunting, they approach an illegally parked car. However, since this is related to the bank robbery, Mike and Steve soon find themselves involved in a shoot-out where they are outgunned. By the time support arrives, the bad guys have fortified their position and taken hostages. There’s a vague Die Hard vibe to all of this but it’s indistinct and poorly developed. Lacking in particular is a forceful villain. The bad guys are generic with only the color and length of their facial hair to distinguish one from another. Nicolas Cage makes for a poor Bruce Willis. He’s too serious and there are no wisecracks forthcoming. After making first contact, Mike becomes little more than an observer as a SWAT team attempts to storm the bank. Instead of focusing on the heist and spending time developing the crime, 211 throws in a bunch of half-baked, poorly developed secondary plotlines. Mike and his daughter, Lisa (Sophie Skelton), are on the outs because he was emotionally unavailable during his wife’s fight with cancer. Lisa, who is married to Steve, is pregnant. Kenny, the ride-along, is bullied in school and, when he fights back, he falls afoul of the institution’s “no tolerance” violence policy. Finally, there’s a female Interpol counter-terrorist expert (Sapir Azulay) who appears randomly with no apparent purpose except to issue dire warnings about how dangerous the bank robbers are. 211 includes the ingredients for a solid (if unspectacular) crime thriller but, as with any recipe, the difference between a palatable dish and a stomach-churning mess is in how those ingredients are combined and cooked. This movie is unappealing and stale, a barely-watchable combination of clichés and irrelevant tangents. 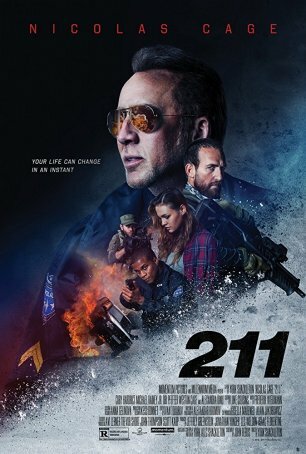 The inclusion of Nicolas Cage is more of a reminder of how far he has fallen than how high 211 has climbed.